It is that period of the year when the streets of New York are loaded with the lots of stylish-looking ladies in the bold outfits and this time is marked with the New York Fashion Week. We present you the best street looks from the snowy streets of New York starting from the bright yellows to the classy blacks and greys. Ece Sukan, editor, opted for the Sandro trousers and Trussardi jacket, which she complemented with the Alexander Wang shoes. Preetma Singh, fashion editor, went for the Prada dress accessorized with the Emm Kuo bag, Laffayette 148 scarf and Marni gloves. Olivia Palermo, socialite, teamed the Juicy Couture skirt and All Saint jacket. As for the footwear, it is from Fendi. Miroslava Duma, editor, wore the total Viva Vox outfit by Oleg Ovsiyov. Anastasia Shatokhina, model, layered the Narciso Rodriguez coat and the H&M jacket. As for the rest, the dress and hat are by Margiela for H&M. Phil, stylist, wore the Barbara Bui trousers and Fremadona shirt. As for the accessories, she picked Alexander Wang handbag and Kenzo footwear. Zanita Morgan, photographer/blogger, picked to wear the Acne coat, Zara jeans, Supermuse sweater and American Apparel shirt accessorized with the Dr. Martens boots and Stylestalker bag. Tamu Mcperson, photographer/blogger, went for the Tibi trousers, Altuzarra jacket, Stella McCartney shoes and Eugenia Kim hat. Lily Kwong, model/writer, picked the dress and shoes both by Altuzarra, which she accessorized with the Reed Krakoff bag. 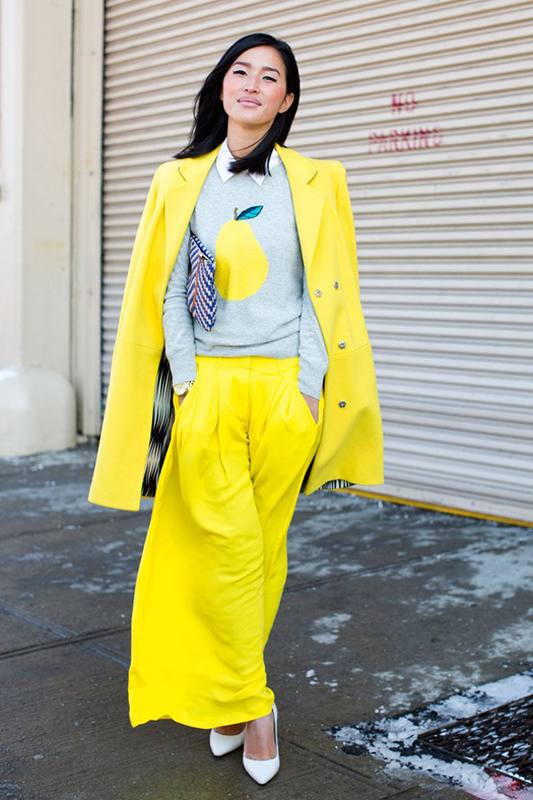 Nicole Warne, blogger, teamed the Camilla and Marc trousers, MSGM coat, J Crew jumper and Kurt Geiger shoes. Caroline Brasch Nielsen, model, wore the total 3.1 Phillip Lim look, which she complemented with the vintage Ray Ban eyewear. Fei Fei Sun, model, coupled the Helmut Lang trousers and the Marni coat, while the gloves are by Balenciaga and the handbag is by Proenza Schouler. Miroslava Duma, editor, opted for the head-to-toe Burberry look accessorized with Noor Fares necklace. Marielas wore the vintage shorts and coat, while the bag is by Celine and the boots are by Dr. Martens. Bo, model, picked the Steven Alan jacket and Acne jeans. She accessorized the look with Alexander Wang bag. Peony Lim, blogger, composed her look from the Tibi shirt, Celine jacket, Zara jeans, Christian Louboutin boots and the Lock&Co hat.